Mahkota Dewa, botanically classified as Phaleria macrocarpa, is a prolific evergreen tree that bears fruit and is indigenous to Indonesia. Also known as God’s Crown, Pau, Makuto Rojo, Makutadewa, Makuto Mewo, Makuto Queen, and Crown of Gods, Mahkota Dewa is known around the world as a healing ingredient that is full of antioxidants. Mahkota Dewa is typically found in home gardens and is used in traditional medicine and as an ornamental plant. Mahkota Dewa fruits are small to medium and oblong in shape, averaging 3-5 centimeters in diameter. The semi-smooth outer skin has small grooves running the length of the fruit and is green when unripe and a vibrant red when mature. The inner flesh is white, fibrous, and watery and contains one to two brown poisonous seeds. Mahkota Dewa cannot be consumed raw, but when processed, it has a slightly sweet flavor. Mahkota Dewa is poisonous and cannot be consumed raw. It is best suited for cooked applications such as boiling or shredded and dried for use in teas and coffees. One of the most popular methods of preparation is to slice the pulp, sun dry, and add to boiling water. Once the fruit is cooked, strain the pulp from the mixture and consume the hot water as a drink. Mahkota Dewa can also be used dried in a tea form and mixed into coffee sachets. Mahkota Dewa will last for a couple of days fresh when stored in a cool and dry place or the refrigerator if available. 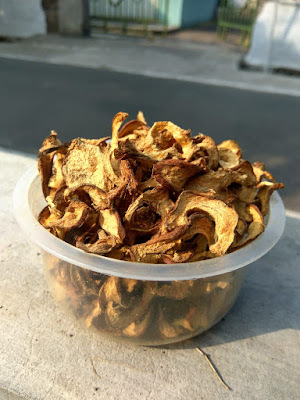 Dried Mahkota Dewa pieces will last for months in a sealed container. Mahkota Dewa fruit contains healing ingredients such as antihistamines, polyphenol compounds, saponins, and alkaloids. Mahkota Dewa fruit has been used in traditional medicine across the world for thousands of years. It is well known in traditional Chinese medicine as an anti-inflammatory, anti-fungal, anti-oxidant, and anti-bacterial. It is widely believed that used in tea, Mahkota Dewa fruit can help reduce symptoms of many health issues and diseases and is still widely used today as a form of alternative medicine. 1. Preventing and healing two of the diseases you fear the most, Tumor and Cancer. 2. Neutralizing the body toxins. 3. Killing any bacteria, virus and fungal in your body. 5. Helping your diet by reducing body weight and making your skin smooth as it contains antioxidants. 6. Preventing and healing the cardiovascular diseases and strokes. 7. Reducing high blood pressure, cholesterol and blood sugar level. 8. Healing uric acid and rheumatic. 9. Ensuring perfect blood circulation and making sure everything works well. 10. Improving the stamina of our body. Why Is Mahkota Dewa So Powerful? The God’s Crown or Mahkota Dewa is so powerful as it has four crucial chemical substances including Flavonoid, Alkaloid, Saponin and Polyphenol. They are the fantastic four that contribute to the superpower of Mahkota Dewa and provide the health benefits this herbal drink gives to the consumers. Our body absorbs various types of food and drinks. We never realize that the consumption of various types of food and beverage ingredients can also be toxic to the body, especially foods and beverages that use a lot of additives. Body organs such as the kidneys and liver function to neutralize toxins, but toxins that accumulate in the body cannot get out all. So the content of alkaloid compounds in the god's crown fruit can help remove all toxins in the body. Bacterial and viral infections can be a serious health problem. Bacteria and viruses can enter the human body through contaminated food and drinks, air and various other sources. Some types of diseases that easily attack the body and are caused by bacteria and viruses such as typhus, cholera, tuberculosis and other types. The benefits of this fruit can improve the body's system to fight bacteria and viruses because they contain saponins. Immunity has an important role, especially to maintain the body's resistance so that it is not affected by various diseases. The immune system is played by antibodies in our own body. If the body is tired or weak, it is susceptible to disease. You can consume the crown god fruit that contains saponin compounds. Even regular consumption with controlled doses can also improve overall body health. Diabetes is caused by the body not being able to produce insulin as a hormone that regulates the supply of blood sugar levels into the body's energy. Diabetes can also be caused because the body has insulin resistance where it is produced excessively or deficient and the body does not have a good response to blood sugar levels. Saponins found in the benefits of the crown god fruit for diabetes can also help the body manage blood sugar levels. Saponins in the crown of the god fruit can also be used to reduce the risk of blood clots. The body will form a very strong response when blood clots occur. This also involves the health of the heart, other organs such as the kidneys, nervous system, brain, bile and all parts of the body. Blood functions to circulate all food substances and is absorbed by the body's cells so that if there is a blood clotting problem it can cause fatal health hazards. Allergy is a body reaction that occurs because the body forms a strong system against the reaction of foreign substances that enter or are inhaled into the body. There are various types of allergies such as allergies to dust, foreign substances, certain aromas, certain foods and various other sources. Allergies can cause harm to the body, especially if it has an effect on the internal organs. The polyphenol content in the god's crown fruit has the benefit of preventing allergies and reducing the potential risk of allergies. It has antihistamine properties so it is good for preventing allergies. Blood vessel blockage is a risk of disease for people who have several health problems such as heart disease, diabetes, hypertension and kidney failure. Blood vessels that work towards the heart and central nervous system can not work normally because there is a buildup of plaque or foreign substances in the body. This can cause the risk of heart disease to be higher. The content of flavonoids in the god's crown fruit can be used to prevent all diseases that cause blockage of blood vessels. Cholesterol in the body actually comes from various types of foods that contain fat. Saturated fats cannot be used for the body as a source of energy because our bodies need them in very small amounts. Various types of foods such as foods fried in palm oil, fat from meat and various other sources of fat have a lot of cholesterol. Cholesterol can cause several potential diseases such as heart disease and stroke. The benefits of the god's crown fruit for health can reduce the amount of cholesterol in the body. The content of flavonoid compounds can effectively reduce the cholesterol content in the body. Treatment with the god's crown fruit should be done with the supervision of herbal medicine experts to avoid all the risks of some side effects of the fruit of the crown of the god. If you want to consume it, you should do it wisely and follow the rules of the experts.